Click on the windows icon in the taskbar to bring up the window menu and click on Settings. Click on Network & Internet in the Settings menu. Select XFINITY from the list of available networks and click it. Click Connect. Wait a few seconds while your computer acquires an IP address from the XFINITY network. The status will display as Connected, signifying you are connected to XFINITY. Select xfinitywifi from the list of available networks and click it. You will be prompted that you are connecting to an unsecured wireless network. Click Connect. Wait a few seconds while your computer acquires an IP address from the xfinitywifi network. The status will display as Connected, signifying you are connected to xfinitywifi. Once you've connected to the xfinitywifi, simply launch your Web browser and you will be taken to the XFINITY WiFi login page. You can recover your username here and password here tools on the Sign In page. If you are an XFINITY Internet customer but do not have a username, you may create one here. After you successfully enter your credentials, you will be directed to the XFINITY WiFi home page. From there, you can begin to browse the Internet. Due to the numerous WiFi devices and configurations available, Comcast is only able to confirm that XFINITY WiFi is functioning correctly. Comcast does not offer technical support for connecting devices to the Internet. Please refer to the user manual for your device should you require additional assistance. Your device should now connect to your private home WiFi network when you are at home and the XFINITY WiFi network when you are connecting away from home. 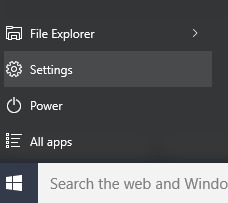 Click on the windows icon in the taskbar of your computer to bring up the window menu and click on Settings. Click on Network & Internet in the Setting Menu. Wait a few seconds while your computer connects. If you have never connected to your private home WiFi network on the XFINITY Wireless Gateway, you will need to enter the Network Key that is printed on the label affixed to the bottom of the Wireless Gateway and click Next. If you have changed the network key from the original setting, enter that key instead. You can find out more about connecting to your Wireless Gateway here. Wait a few seconds while your computer or device connects, and you're done!. Click on WiFi to see the list of available networks (SSIDs) and scroll down and click on Manage Wi-Fi Settings. From the Start screen, select the Desktop icon. 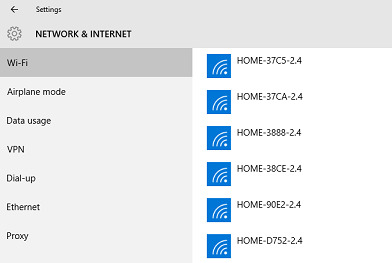 Click on the Wireless icon in the taskbar to see the list of available networks (SSIDs). You will be prompted to confirm if you have user name and password to connect to the network. 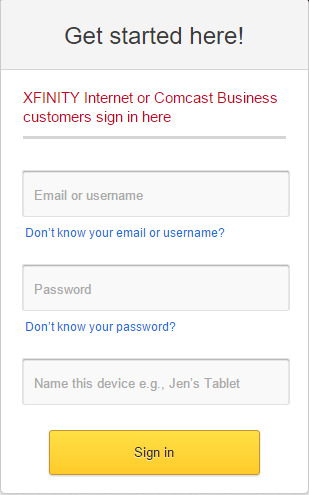 Click on No, open a web browser to complete the connection and proceed with signing in to XFINITY WiFi. Once you've connected to the xfinitywifi and clicked on open a web browser to complete the connection, you will be taken to the XFINITY WiFi login page. You can recover your username here and password here . If you are an XFINITY Internet customer but do not have a username, you can create one here. 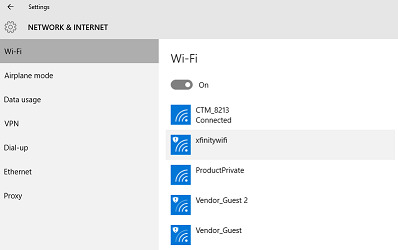 If you have downloaded the XFINITY WiFi Windows connection manager and signed in, your device will automatically connect to your private home WiFi network at home and XFINITY WiFi when visiting a friend or traveling around town. From the Windows 8 Start screen, select the Desktop icon. 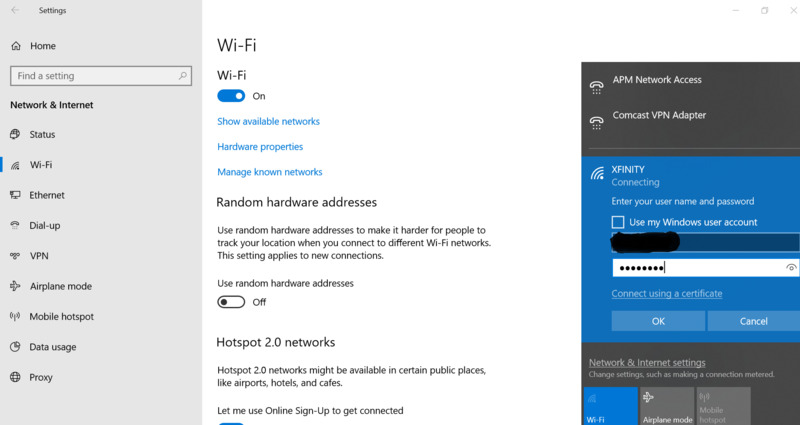 Click on the Wireless icon in the taskbar to see the list of available networks (SSIDs). Wait a few seconds while your computer or device connects, and you're done! Scroll to the network name that you want to forget and right click on it to bring up the options menu. Select Forget this network from the options menu to forget the network. 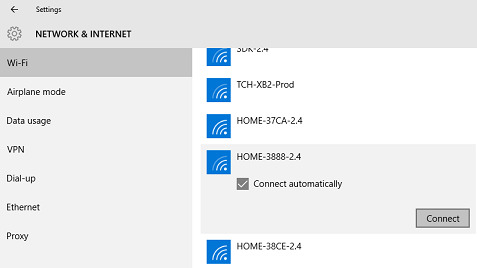 Click on the WiFi icon in the notification area of the taskbar to see the list of available networks (SSIDs). Select xfinitywifi from the list of available networks and click it. Click Connect. You may be prompted to select a location for the xfinitywifi network - select the Public Network option. 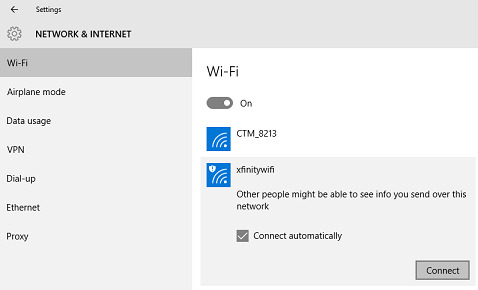 Once you've connected to xfinitywifi, you will see a prompt in the taskbar to provide additional login information. Click it to launch the browser and you will be taken to the XFINITY WiFi login page. You can recover your username here and your password here If you are an XFINITY Internet customer but do not have a username, you can create one here. If you have previously connected to XFINITY WiFi and your private home WiFi network, start at step 3 below. Click on the Wi-Fi icon in the notification area of the taskbar to display the list of available networks, and then click on Open Network and Sharing Center at the bottom of the list. Click on Manage Wireless Networks in the menu on the left hand side of the window that appears. Click on the private home WiFi network and then click on the Move up button until the private home WiFi network is at the top of the list of networks you can view, modify and reorder. Next, select the XFINITY WiFi network and click on the Move up button until the XFINITY WiFi network is second highest in the list, just below your private home WiFi network. Close the window and you're done! Your device should now connect to your private home WiFi network when you are at home and the XFINITY WiFi network when you are connecting away from home. Click Start then select Connect To for the list of available networks (SSIDs). Select xfinitywifi from the list of available networks and click it. Click Connect. You will be prompted that you are connecting to an unsecured wireless network. Click Connect Anyway. Wait a few seconds while your computer acquires an IP address from the xfinitywifi network. Once you've connected to the xfinitywifi network, simply launch your Web browser and you will be taken to the XFINITY WiFi login page. You can recover your username here and your password here If you are an XFINITY Internet customer but do not have a username,you can create one here. Click on the Wi-Fi icon in the notification area of the taskbar to display the list of available networks, click on Open Network and Sharing Center at the bottom of the list. To get the best XFINITY WiFi experience, download the XFINITY WiFi Mac profile from here. For latest security features install the XFINITY WiFi profile. Click Begin Installation. Follow the OS prompt to install the profile. Click Install. If prompted for credentials, enter your local username/ password and click OK. Profile is successfully installed. The application will automatically connect you to XFINITY WiFi and gives you access to XFINITY WiFi security features. To get the best XFINITY WiFi experience, download the XFINITY WiFi app from here or a security profile here. If you do not want to download the app and are connecting to XFINITY WiFi for the first time, follow the below mentioned steps. Make sure WiFi is turned on. To turn WiFi on, tap Settings. Tap WiFi. Make sure WiFi is set to ON. If WiFi is set to OFF, tap the OFF button to turn it on. Once WiFi is turned on, wait a moment as your iPhone detects the WiFi networks in range. Wait a few seconds while your iPhone or iPod acquires an IP address from the xfinitywifi network. Once connected, a check mark will appear in the WiFi menu next to the xfinitywifi SSID. Once you've joined the XFINITY WiFi network manually, your iPhone will automatically connect whenever the network is in range of one of XFINITY WiFi hotspots. Once you've connected to xfinitywifi network, simply launch your web browser and you will be taken to the XFINITY WiFi login page. You can recover your and username here and your password here If you are an XFINITY Internet customer but do not have a username , you can create one here. If you have downloaded the XFINITY WiFi app and installed the XFINITY WiFi profile by signing in, your iPhone/ iPod will automatically connect to your private home WiFi network at home and XFINITY WiFi when visiting a friend or traveling around town. If you have manually connected to XFINITY WiFi and your private home WiFi network, the connection behavior will depend on the iPhone/iPod version of your device. If your iPhone is on iOS6 or above (or if it is iPhone5), it will automatically connect to your private home WiFi network at home and XFINITY WiFi when you are visiting a friend or traveling around town. If your device is an iPhone 4S (or older) and iPod, it will connect to the most recently connected network, if that network is available. 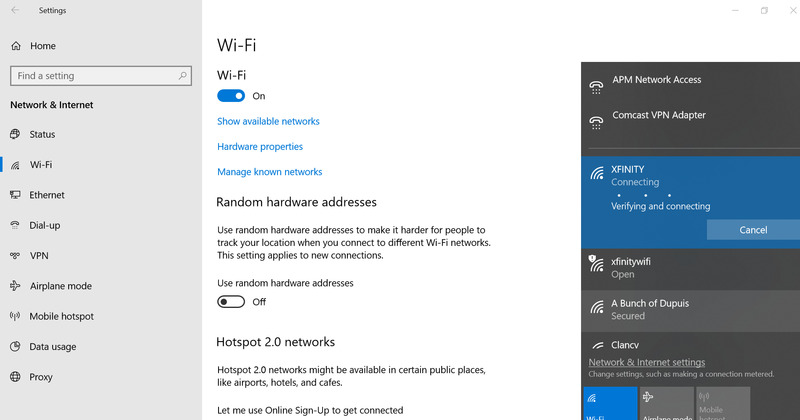 If your device has not connected to your private home WiFi network by default, follow the steps below to connect to your private home WiFi network. Tap Settings. Tap WiFi to see the list of available networks (SSIDs). To connect to your private home WiFi network, tap on the network name of your private home WiFi network in the menu (usually this will be the network with the strongest signal, typically beginning with the word “HOME”). Wait a few seconds while your computer connects. If you have never connected to your private home WiFi network on the XFINITY Wireless Gateway, you will need to enter the Network Key that is printed on the label affixed to the bottom of the Wireless Gateway and tap Join. If you have changed the network key from the original setting, enter that key instead. You can find out more about connecting to your Wireless Gateway here. Wait a few seconds while your computer or device connects, and you're done! Please note that these steps may need to be repeated if you want your iPhone/ iPod to connect to your private home WiFi network when you are at home. Use the trackball to scroll to the icon for Manage Connections and click. When you are connected, the WiFi logo across the top of your screen will turn black, and xfinitywifi will display on the main screen below the clock. Once you've joined the XFINITY WiFi network, your BlackBerry will automatically connect to it whenever the network is in range. After you've connected to xfinitywifi, you'll need to configure the BlackBerry browser to use WiFi as the preferred Internet connection. You can recover your username here and password here. If you are an XFINITY Internet customer but do not have a username, you may create one here. Scroll to your private home WiFi network in the list of saved Wi-Fi networks, then press and hold this option to access the menu (or click the key). Select the Move option and move your private home WiFi network to the top of the list of saved Wi-Fi networks. Scroll to the xfinitywifi network in the list of saved Wi-Fi networks, then press and hold this option to access the menu (or click the key). Select the Move option and move the xfinitywifi network until it is the 2nd highest on the list, just below your private home WiFi network. Select Save to save the changes to your Wi-Fi settings. Your device should now connect to your private home WiFi network when you are at home and the XFINITY WiFi network when you are connecting away from home. From the BlackBerry home screen, select the Menu key. Scroll down to the Wi-Fi Network option and click. Wait a few seconds while your device connects. If you have never connected to your private home WiFi network on the XFINITY Wireless Gateway, you will need to enter the Network Key that is printed on the label affixed to the bottom of the Wireless Gateway and click Connect. If you have changed the network key from the original setting, enter that key instead. You can find out more about connecting to your Wireless Gateway here. Wait a few seconds while your device connects. Once your BlackBerry connects you'll see Connection Successful! across the top of the screen. Tap on the Wi-Fi option in the Settings menu Make sure WiFi is set to ON. If WiFi networking is set to off, tap the toggle switch to turn it on. Find xfinitywifi from the list of available networks and tap it. Wait a few seconds while your phone acquires an IP address from the xfinitywifi network. Once connected the phone will show as connected under the xfinitywifi SSID name. 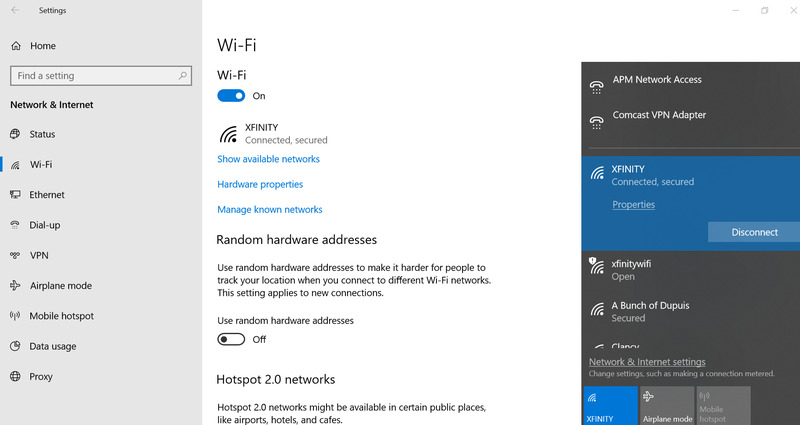 Once you've joined the XFINITY WiFi network manually, your Windows phone will automatically connect whenever the network is in range of one of XFINITY WiFi hotspots. you can recover your username here and password here If you are an XFINITY Internet customer but do not have a username, you can create one here. If you have manually connected to XFINITY WiFi and your private home WiFi network, the connection behavior will depend on the order in which you connected to these networks. 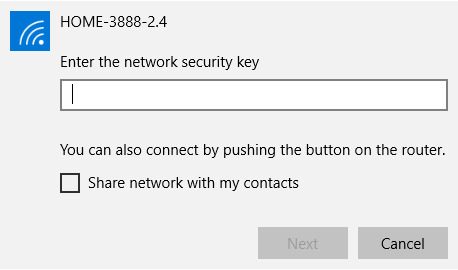 Most Windows phones attempt to connect to the most recently connected network that is available. Tap on the Wi-Fi option in the Settings menu. Make sure WiFi is set to ON. If WiFi networking is set to off, tap the toggle switch to turn it on. 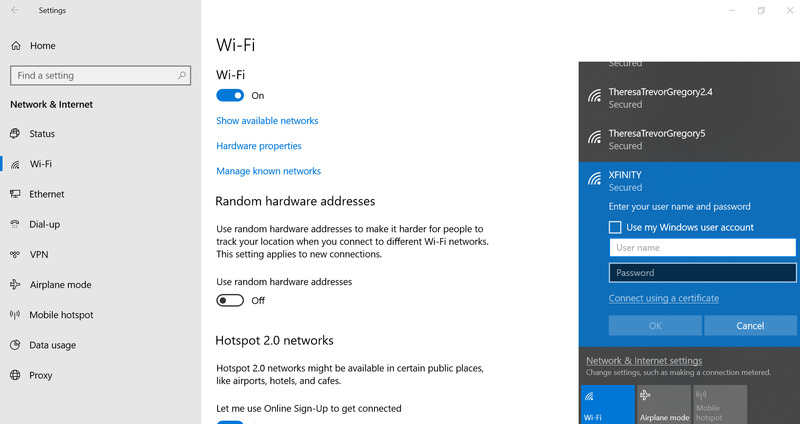 Once WiFi is turned on, wait a moment as your Windows phone detects the WiFi networks in range. Wait a few seconds while your phone connects. If you have never connected to your private home WiFi network on the XFINITY Wireless Gateway, you will need to enter the Network Key that is printed on the label affixed to the bottom of the Wireless Gateway and tap Connect. If you have changed the network key from the original setting, enter that key instead. You can find out more about connecting to your Wireless Gateway here. Wait a few seconds while your phone connects, and you're done! Please note that these steps may need to be repeated if you want your phone to connect to your private home WiFi network when you are at home. Tap on Start, flick left to the App list, and then tap on Settings to bring up the Settings menu. Tap on the Wi-Fi option in the Settings menu. Find xfinitywifi from the list of networks then tap and hold on the network name. In the menu that appears below the network name, tap on Delete to forget the network. To get the best XFINITY WiFi experience on Android phones (OS version 4.4 and above), download the XFINITY WiFi app here. The application will automatically connect you to XFINITY WiFi and gives you access to XFINITY WiFi security features. Make sure WiFi is set to ON. If WiFi is set to OFF, Tap the Wi-Fi toggle switch to turn on Wi-Fi. Once WiFi is turned on, wait a moment as your Android phone detects the WiFi networks in range. Once you've joined the XFINITY WiFi network manually, your Android phone will automatically connect whenever the network is in range of one of XFINITY WiFi hotspots. You can recover your username here username here and your password here If you are an XFINITY Internet customer but do not have a username, you may create one here. For Android phones running OS version 4.4 and above, if you have downloaded the XFINITY WiFi app and signed in, your phone will automatically connect to your private home WiFi network at home and XFINITY WiFi when visiting a friend or traveling around town. 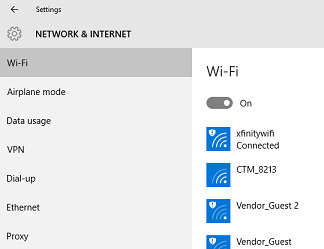 If you have manually connected to XFINITY WiFi and your private home WiFi network, the connection behavior will depend on the order in which you connected to these networks. Most Android phones attempt to connect to the most recently connected network that is available. 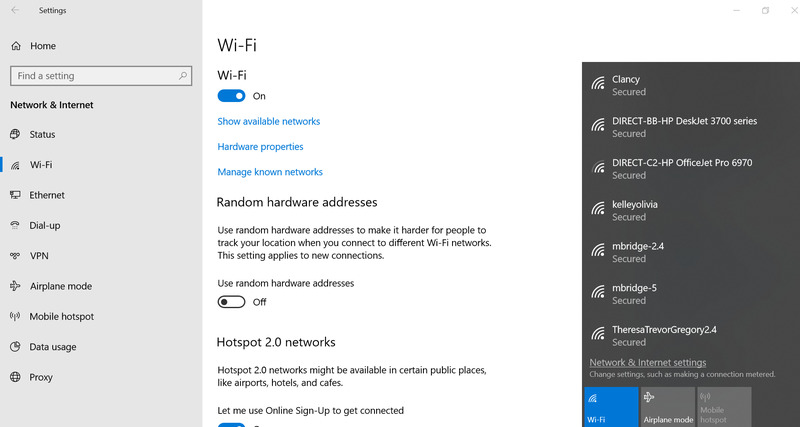 If your device has not connected to your private home WiFi network by default, follow the steps below to connect to your private home WiFi network. To get the best XFINITY WiFi experience, download the XFINITY WiFi app here or the XFINITY WiFi security profile here. If you do not want to download the app or the security profile and are connecting to XFINITY WiFi for the first time, follow these steps. Make sure WiFi is turned on. To turn WiFi on, tap Settings. Tap Wi-Fi. Once WiFi is turned on, wait a moment as your iPad detects the WiFi networks in range. Available WiFi networks appear under Choose a Network. Find xfinitywifi from the list of available networks and tap it. . Wait a few seconds while your iPad acquires an IP address from the xfinitywifi network. Once connected, a check mark will appear in the WiFi menu next to the xfinitywifi SSID. Once you've joined the XFINITY WiFi network manually, your iPad will automatically connect whenever the network is in range of one of XFINITY WiFi hotspots. You can recover your username here and password here. If you are an XFINITY Internet customer but do not have a username, you can create one here. If you have not downloaded the app or a security profile and you have manually connected to XFINITY WiFi and your private home WiFi network, the connection behavior will depend on the iPad version of your device. If you have an iPad 3 or later, it will automatically connect to your private home WiFi network at home and XFINITY WiFi when you are visiting a friend or traveling around town. If your device is an iPad 2 or older, it will connect to the most recently connected network, if that network is available. Make sure you are in range of your home WiFi network before getting started. Tap Settings. Tap Wi-Fi to see the list of available networks (SSIDs). To connect to your private home WiFi network,tap on the network name of your private home WiFi network in the menu (usually this will be the network with the strongest signal, typically beginning with the word “HOME”). Wait a few seconds while your computer or device connects, and you're done! Please note that these steps may need to be repeated if you want your iPad to connect to your private home WiFi network when you are at home. If you want to connect to XFINITY WiFi for the first time manually, follow the steps below. Please note the screens might slightly vary based on the Android OS version. Tap the WiFi icon to show the list of available WiFi networks. Make sure WiFi is set to ON. If WiFi is set to OFF, tap the Wi-Fi toggle switch to turn on WiFi. Once WiFi is turned on, wait a moment as your Android tablet detects the WiFi networks in range. Wait a few seconds while your tablet acquires an IP address from the xfinitywifi network. Once connected, the tablet will show as connected under the xfinitywifi SSID name. Once you've joined the XFINITY WiFi network manually, your Android tablet will automatically connect whenever the network is in range an XFINITY WiFi hotspot. For Android tablets running OS version 4.4 and above, if you have downloaded the XFINITY WiFi app and signed in, your tablet will automatically connect to your private home WiFi network at home and XFINITY WiFi when visiting a friend or traveling around town. If you have not downloaded the app and have manually connected to XFINITY WiFi and your private home WiFi network, the connection behavior will depend on the order in which you connected to these networks. Most Android tablets attempt to connect to the most recently connected network that is available. Wait a few seconds while your tablet connects, and you're done! Please note that these steps may need to be repeated if you want your tablet to connect to your private home WiFi network when you are at home.